What has been your best highlight of The Habbox Summer Spectacular 2018? 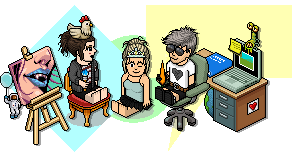 Thread: What has been your best highlight of The Habbox Summer Spectacular 2018? The New Friends Iv Made! I ACTUALLY WON SOME EVENTS THAT WERENT RUTHS DANGER POD!!!! 4real though it's been a truly amazing HxSS this year, I've usually enjoyed the tournaments as a whole but every year there have been things that ruined it - people being horrible and abusive largely, or attempting/succeeding in cheating and making a mockery of the entire system - but this year we haven't had that. With the exception of a few individual trolls here and there (and a couple of very minor hiccoughs), everyone has been friendly and even the team banter hasn't been aggressive. NEVER before in all my years have I got to the end of HxSS and though "awww no" instead of "FINALLY". For me the best part wasn't a single moment, it was the entirety of the tournament and the spirit with which near enough everyone got into it. It's mushy and makes me sound like a hippy, but there's been a lot of love and goodwill through it even among rivals. Think i just agree with flyingjesus the whole Hxss this year has been amazing this year and its been a pleasure hosting lots for you all with no trouble or drama and all the lovely team spirit just everyone whos gotten involved has been lovely. But i think my highlight is being able to dj for my fan club ran by my biggest fan @Samantha;. But really i've gotten far more confidence on air over this hxss i used to get so nervous speaking on air but now im happy to go on air and talk. Last edited by RuthOnToast; 20-08-2018 at 01:32 AM. but o/t yes I loved that other than a bit of banter here and there, there wasn’t really any bullying of other teams or trolls or anything! I didn’t get on as much as I would’ve liked but every time I was on the community was pumping (or in dj Toasts words ‘poppin’ @RuthOnToast; ) and lovely no matter what team they’re on. Also as green wasn’t winning this year I got cheered on by more than just my team ahahaha that was nice! The team spirit and most importantly all the times I won a reasonably difficult skill-oriented event and at least two Habbos did **** something of the kind "has he WON"
Last edited by LUCPIX; 29-08-2018 at 09:47 PM.